Perennial herb, tufted 35 cm - 1.5 m tall Leaves: alternate, two-ranked. Sheaths keeled or compressed. Ligules to 3 mm long, membranous, erose (appearing unevenly cut or incised) along the margins or fringed with hairs. Blades 8 cm - 0.5 m long, 2 - 12 mm wide, folded or flat, parallel-veined, smooth or minutely rough, sometimes sparsely softly hairy basally. 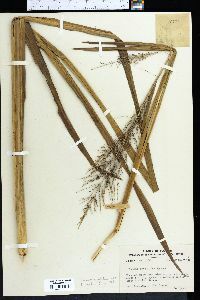 Inflorescence: a dense, branched arrangement of spikelets (panicle), terminal and axillary, 9 - 40 cm long, one-third to three-fourths as wide as long. Fruit: a caryopsis, indehiscent, enclosed within the persistent lemma and palea. Culm: stout, 35 cm - 1.5 m long, compressed. Spikelets: nearly stalkless, green and tinged purple or purple, 1.5 - 4 mm long, lance-shaped. Glumes: unequal, herbaceous. Lower glumes to three-fourths as long as spikelets, three-veined, midveins keeled. Upper glumes nearly equal to or slightly longer than lower lemmas, often spreading slightly apart at the apex, minutely rough at the apex, five-veined, midvein keeled. Lemmas:: Lower lemmas similar to and nearly equal to or slightly shorter than upper glumes, often spreading slightly apart at the apex, minutely rough at the apex, five-veined, midvein keeled. Upper lemmas clasping upper paleas for all their length, stiff, thick, shiny, with rolled-up margins on the upper surface. Paleas:: Lower paleas small, to two-thirds as long as lower lemmas, transparent. Upper paleas longitudinally lined. Florets:: Lower florets sterile. Upper florets bisexual, sometimes stalked, 1.5 - 2 mm long, 0.5 - 1 mm wide, to three-fourths as long as spikelets, pointed at the apex, shiny, with a tuft of minute hairs at the apex. Anthers three. Stigmas red. Habitat and ecology: Moist to wet areas. Etymology: Panicum comes from the Latin word panis, meaning bread, or panus, meaning "ear of millet." Rigidulum means "somewhat rigid."